Vinopanion | Blog | Hello Vino & @drXeNo! 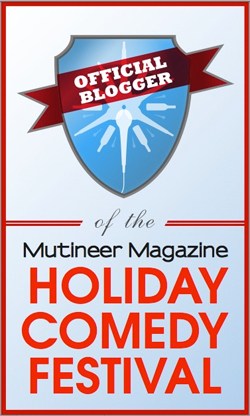 WineLog » Blogs » Vinopanion » Hello Vino & @drXeNo! Following a dizzying string of new partnerships between WineLog, myself and other fine and fun wine partners, we are now part of a very cool and useful iPhone app that has been newly relaunched. Hello Vino takes the hard part out of picking a wine while on the go to whole ‘nother level. Choose a pairing based on the food on the menu in front of you, choose the food for the glass you just ordered at the wine bar or just search for a distinct wine style or producer…all taken care of very quickly. It’s also all dialed in to your favorite social networks (their on Twitter themselves) so that you can brag to educate all of your friends about your synergistic food and wine choice. If you pairing is a match made in digestive heaven, you can even buy the wine straight from your iPhone. The innovative folks at Hello Vino have launched a new feature on the app which features wine reviews and blog posts about many of the favorite wines in their database. I have a number of wine reviews up there already, as do many of my superbly talented vinopanions, such as Notes From the Cellar‘s Steve Paulo (Twitter), Luscious Lush Thea Dwelle (Twitter) and 1WineDude’s Joe Roberts (Twitter, Twitter2). The Chicago Tribune’s Bill Daley (Twitter) also has a number of reviews on the site. I highly recommend downloading this intuitive wine app and adding it to your arsenal of iPhone apps. Let me know what you think about the new features in the comments below! Thanks for the tip drXeNo! I will now have access to all the great info/reviews from WineLog via Hello Vino wherever I go. Happy Thanksgiving! I love the idea of allowing etgsus to choose the wine of their preference; as you say, it takes away any stress over doing what’s right and creates a more fun environment. I think Shadow is a terrific addition to any of your videos by the way!! 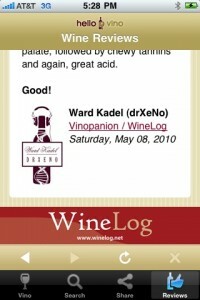 Such a pleasure to work with you, Ward – you’re reviews and articles are an amazing contribution to the Hello Vino app. Thanks for being a part of it!! Thanks Jason, I appreciate your kind comments. I’m excited for the new audience we can reach for WineLog, as well! Congrats to you (and us as well I guess). Goes to show that quality content will get attention. You’re one of the best.